If you've got a cookie exchange coming up, these are the perfect cookies to bake! Nobody can resist these tender pecan cookies finished with a festive topping of grated white chocolate. Bake 20 minutes or until edges are lightly browned. Cool completely on wire racks. Microwave semi-sweet chocolate in microwaveable bowl on MEDIUM 1-1/2 minutes or until chocolate is almost melted. Stir until chocolate is completely melted; set aside. Grate white chocolate into shallow bowl. 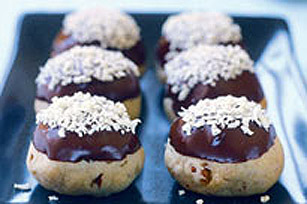 Dip each cookie halfway in the melted chocolate, then in the grated white chocolate to create a snowy appearance. Let stand until chocolate is firm. To avoid static cling when grating chocolate, remove and discard paper wrappers from the chocolate. Place chocolate in microwaveable bowl. Microwave on MEDIUM 20 seconds to soften chocolate slightly before grating.